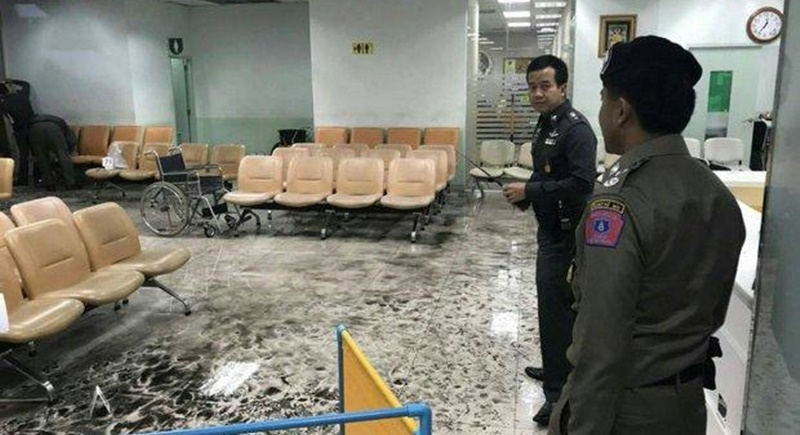 BANGKOK: Three staff members of Phramongkutklao Hospital were questioned yesterday (May 28) in connection with the bomb blast on May 22 at the hospital which injured 25 people. Meanwhile, a woman suspected of being involved in sending bomb warnings to leading state hospitals was taken for questioning on Saturday night (May 26), a source said. Two women and one man working at Phramongkutklao Hospital were taken by security officers for questioning yesterday, the source said. They are being questioned in relation to the blast that took place at the dispensary’s waiting room, known as the Wongsuwon room, last Monday. It is named after ex-army command and current first Deputy Prime Minister Prawit Wongsuwon. The names of suspects and the place of questioning were not revealed. Earlier, Gen Panlop Pinmanee, former deputy director of the Internal Security Operations Command; Gen Chaiyasit Shinawatra, a former supreme commander and a cousin of former Prime Minister Thaksin Shinawatra; and red-shirt hardliner Wuthipong “Kotee” Kochathamakun, denied they were linked to the hospital blast after the government suggested it was the work of red shirt hard-liners. Gen Panlop, 81, said he has served as a soldier all his life and was well aware hospitals and medical facilities are supposed to be off-limits to conflict. He also insisted he does not personally know Mr Wuthipong. Gen Chaiyasit, 71, had also defended himself, saying he has avoided politics for some time and often uses medical services at Phramongkutklao Hospital. Earlier, Gen Chalermchai said new information has emerged suggesting the hospital bombing was carried out by Mr Wuthipong’s network. He said the group constantly uses social media to instigate violence, adding investigators are still looking into whether there is any connection between the hospital bomb blast and the recent arrest of hardliners. Mr Wuthipong was also implicated in another case in which a cache of weapons was confiscated in Pathum Thani in March. Meanwhile, a 51-year-old woman was taken from her house in Prawet district on Saturday night by military officers attached to a special task force of the 11th Military Circle for questioning, a source said. Her name was not disclosed. She is suspected of being involved in the sending of bomb warnings to the National Cancer Institute on Rama VI Rd and the Prasat Neurological Institute on Ratchawithi Rd before the bomb at Phramongkulklao Hospital went off. The source said military officers found copies of bomb warnings at her office. An investigating team handling the hospital’s bombing case and deputy national police chief Gen Srivara Ransibrahmanakul had joined the questioning session. According to the source, the woman has denied her involvement in sending the warnings. She has also denied her involvement in the earlier explosion in front of the National Theatre near Sanam Luang and the blast outside the old Government Lottery Office on Ratchadamnoen Klang Ave.